New users and the Cavalry Bonus – Poll. Analytics has shown me that a number of new users have been using the new bonus cavalry units in newly created games. However, what I do not know yet is how those battles are going? Do the experienced players enjoy the extra challenge? How are the battles? Or in short – let me know with this poll. Everyone can respond, even new users. Use ‘Other’ to go into more detail if you like. The 1.72 update is mostly just incremental enhancements and bug fixes with the exception of one legendary battle. The old version of this battle (RIP) is has been replaced with an entirely new battle. • No reinforcements or countdowns. • 6 Cavalry & 6 Pikemen (both sides) – plus Commander and SF units. • New unit starting positions. • Set inland more with a bit of the water still visible. • Includes a second long badly beaten up wall with a few holes. • Trees scattered on one side of the wall. • No external objective. Battle ends when one side falls back (or CK). • The winner gets favourable ground in the final Naarden battle. • No new SF unit reinforcements after this battle. Also like the old battle, terrain on both sides is not similar at all. There is a lot of interesting conflict potential with each side separated by a very long weak wall with most sections easily destroyed by a single cannon shot. One side of the wall is wide open, the other side is crowded with trees. Commanders can fight from each side, or both on one side or the other. The tree side is hard to defend from all the fast (sometimes hidden) units, and the clear side is open to easy attacks. The map will be a blast to play and will now be a major highlight just before the final battle. The design was intended to be a personal battle between the Commanders and the SF units. With weak destructible walls and multiple directions to attack from we are guaranteed a new experience every time we fight here. Special thanks to Grand Duke Wrecktangle.ent who pushed me hard to preserve a piece of the star-fort theme for this important 7th battle. He also provided me with example map mockups to point me in the right direction and threatened to drown me in Naarden historical facts before I finally agreed to his demands. I was initially planning to do a simple forrest map but this new map is dramatically better. Also thanks to another Grand Duke for his many bug reports and one special issue that touched us all recently. The cavalry charge bug is now fixed and charging is now better than ever thanks to Slayyer0. It has never been better for new players. We have a great Community here and Musket Smoke is a product of our collaborations and efforts over the years. (Manual, maps, testing, units, etc). Many of our regular players have played a significant part in making this game or improving it. And now it’s never been better to be a new player. This 1.72 update gives new players more online action by removing the new player zone (aka: the dead zone) and brings those players into the active area where everyone goes to find a friendly partner to engage with. Also the new player cavalry reinforcements update and recent balancing adjustments for both battles and artillery help dramatically. Not to mention recent usability enhancements designed to reduce new player confusion. All this activity and recent updates amounts to a giant red carpet welcoming new players into our war ravaged community. Message to old players: I’ll see you on the battlefield after dinner or breakfast – as usual. Our endless battles never get old. Message to new players: Welcome to the family! The attempted solution here is to give these new players more units as a handicap. Not for long mind you. Just until they get their battle legs. For campaigns this is only until the player gets 30 pie pieces (total). So for example if they kill 20 men in mini matches and win one battle in the campaign they will have 30 pie pieces. Then the handicap will no longer apply moving forward with the campaign. For the Mini-Matches this works a bit differently. If the player has 200 pie pieces or less they get 1 extra cavalry unit. Regardless, if the new player doesn’t want the handicap they can turn it off by simply turning it off in the options. For the campaign the handicap doesn’t apply every battle and just adds 4 cavalry units with +1 confidence. Some of you may know this boost as what happens when one side has little or no SF units left and the other side has lots. It’s the same bonus rule only being activated now for new players to give them a fighting chance. Again this is a big experiment. It might be not enough, it might be too much. 1.72 will likely adjust things or remove it if it turns out this was a bad idea. I think it will be interesting. As a seasoned player I welcome the challenge of a larger army with a less experienced commander. The scoring hasn’t changed. You still win with 10 kills in a Mini Match regardless of how many units are still galloping around. Feel free to email me with any stories of how things go with this experimental auto handicap. I need the feedback if you want things to be tweaked. 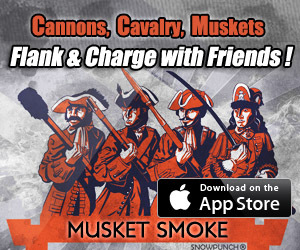 Musket Smoke 1.7 will shake things up! I’ve been busy this last year with non-game iOS development (regular app building) and Musket Smoke was overdue an update. Being an older app from way back in the iOS 6 days, the game had some archaic chunks of code that iOS 9 rightly clobbered. I swapped my iPhone 6 for my wife’s 5s (as she is a heavy social media user) and so I didn’t notice that the larger iPhone layouts were broke by iOS 9. (Before 1.7 I hardly ever played on iPhone). In-app purchasing also got clobbered and so people with new devices couldn’t restore, worse yet – new campaign buyers couldn’t even get what they paid for! Check out this recent classy 5 star review by Starkip. He downloads Musket Smoke 1.62 and pays for the campaign and after several attempts to get the campaign going he finaly gives up in frustration and writes a review to let me know. But still amazingly gives the game 5 stars! May all his mortar-strikes land true!! So this issue was hitting me on all fronts. First my customers were suffering, and second my reputation as a developer was getting slandered as potential new opportunities were no doubt checking out my apps and seeing a right disaster on the iPhone 6. But before the (1.62, iOS 9 issues) – iPhone support in Musket Smoke was always a secondary thing that I never took serious. It was more just so we could continue playing when we are out on the go and also to reach more mobile eyes (so they could download on their iPads). Not so any more. I put a quality few days into shaping up the experience on the little screens. Mind you, the I am on a budget here and can’t redo the manual or anything that heavy in content but I did spend time and make the play experience a lot better on the iPhone. The in-app purchases are now back online as well. If you bought the Campaign then just hit the restore button after you update to 1.7. So what was the shakeup then? A couple potentially controversial changes to the Naarden Campaign. Changes to the first and last battles. The Campaign design is supposed to be a fair contest between two players with a rich array of interesting conflicts along the way. Win the minor battle objectives along the way – gives points, bragging rights. Minor battle defeats also grant an SF re-enforcement. Protect your SF units and try to eliminate your opponent SF units (as they affect the final battle). Try to take out the enemy Commander while protecting your own. A complicated task because the Commander is a powerful unit that we like to keep (somewhat) close to the font lines. Not to mention the regular troops who form the backbone of whatever strategy you are pursuing. However what I didn’t expect was that rewarding artillery to only ‘one side’ made it overly difficult for the other side to stay in the fight (even with the SF Pikemen runner up reward for losing). For example I have never lost the Siege Cannon battle when armed with a mortar (even vs the top ranked Grand Dukes). To fix this I replaced the SF Pikeman reward for the defeated Commanders with the same SF Artillery re-enforcement that the winner gets. The 1 3 5 maps still reward the same (Leader / SF Pikeman) – but now maps 2,4,6 reward (SF Mortar, SF Mortar), (SF Siege Cannon, SF Siege Cannon) and (SF Howitzer, SF howitzer). Now I believe my vision of Musket Smoke is complete. This was always the intended direction and now the game is more interesting for both – new players and Grand Dukes alike. Plus who doesn’t like more artillery? So now strategy will be less about ‘winning a reward’ and more about destroying your opponents artillery re-enforcements (while protecting your own) – as it always should have been. It’s a more realistic gritty tone and focus moves back to where it should be in war – taking out key resources and leaders. Winter Keep (first map), removed the middle tree (opens up a path between the trees) and changed the starting unit positions of both armies to remove the Dutch first move advantage and also make each side look a bit more distinctive. Plus just to shake things up a little as this is map gets the most action and change is good. Naarden, however only has terrain changes. It’s pretty dramatic however. Instead of suddenly DOWN TOWN in the middle of streets and buildings, we fight on the outskirts with just a military compound and a church. The rest is just light trees and streets. Technically the same map with all the little buildings converted to light trees. I’ve heard from few players that it seems too defensive like a ‘knife fight’ and so this should open things up a lot – tactically. Not to-mention both sides will likely have a howitzer to help keep the chill off the enemy backsides. The Naarden campaign is now a more comprehensive skill test of skill across the entire war, and no longer hinges on a couple early key battles (that new players have no idea about). Now ‘every battle’ counts and you have the artillery to back you up! I can hardly wait to rack up some 1.7 campaign battles. The 3 extra pieces of artillery for the other side will make a world of difference across every battle. Winter Keep: New starting positions and a terrain change. A fresh battle with the new gap in the trees playing a surprisingly large roll in tactics. Howitzer Bridge: focus more on taking out the Commander or the Leader unit. Try new tactics. The Wheat Fields: 2 mortars +2 howitzers will make a very smokey field. I will be hunting for the opponents mortar in all the smokey chaos. The ammo hut being a secondary goal. Cannon Showdown: Finally a fair fight! It will be interesting as an extra mortar will partially de-tooth the golden cannons and open up more opportunities for troop movement and cavalry assaults. The Breach: A LOT of smoke and extra holes in the wall means decent opportunities for tactical SF unit killing. The artillery presence here will be intense! Artillery Transport: A strong focus on SF unit killing. This is your last chance before the siege battle. The Big Siege: Enjoy this map while you can. In a couple months (update 1.71) will replace it with a new more balanced map. Extra artillery should make it interesting in the meantime. Naarden: Just open roads and light trees now. It’s a whole new battle. Likely both sides will have a howitzer so it’s best to not stand around. You have a city capture or defend and war ready to give out a Victory. If the extra artillery turns out to be a bit too much, then next update I might reduce 1 piece of standard artillery from some of the maps. So enjoy the extra heavy artillery while it lasts! Happy hunting, and beware the wet musket!